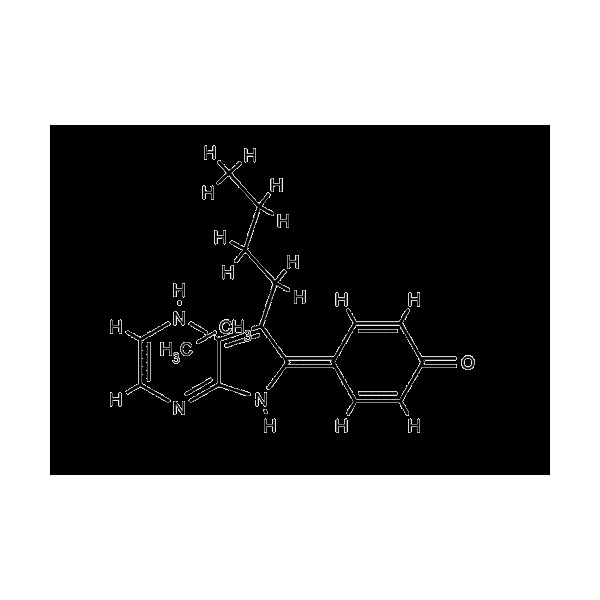 Background: Aloisine A (RP107) is a cell-permeable compound that acts as a potent, selective, reversible, and ATP-competitive inhibitor of cyclin dependent kinases Cdk1/cyclin B, Cdk2/cyclin A, Cdk2/cyclin E, and Cdk5/p25 with IC50 values of 150nM, 120 nM, 400 nM and 200 nM, respectively. Also inhibits activity of glycogen synthase kinase-3 (GSK-3) with IC50 values of 500 nM and 1.5 uM for the GSK-3 alpha and the GSK-3 beta isoforms, and c-Jun N-terminal kinase (JNK) with an IC50 of approximately 3-10uM. It inhibits cell proliferation by arresting cells in G1 and G2 phase. Mettey Y, Gompel M, Thomas V, Garnier M, Leost M, Ceballos-Picot I, Noble M, Endicott J, Vierfond JM, Meijer L. (2003) "Aloisines, a new family of CDK/GSK-3 inhibitors. SAR study, crystal structure in complex with CDK2, enzyme selectivity, and cellular effects." J Med Chem. 46(2):222-36.